Encephalocele is a rare lesion, with embryological mesodermal anomaly resulting in a defect in the calvarium and dura associated with herniation of meninges, cerebrospinal fluid (CSF), and\or brain tissues through a defect that is usually covered by the scalp. However, an increase in pressure inside the sac may lead to stretching of the overlying skin, ulceration, and CSF discharge. Depending on the content of the sac it may be meningocele which contains CSF and meninges or meningoencephalocele which contains meninges, CSF and neural tissue as sac contents. The incidence of encephalocele is approximately 1 per 5,000 live births  ; occipital encephalocele is more common in females than males. 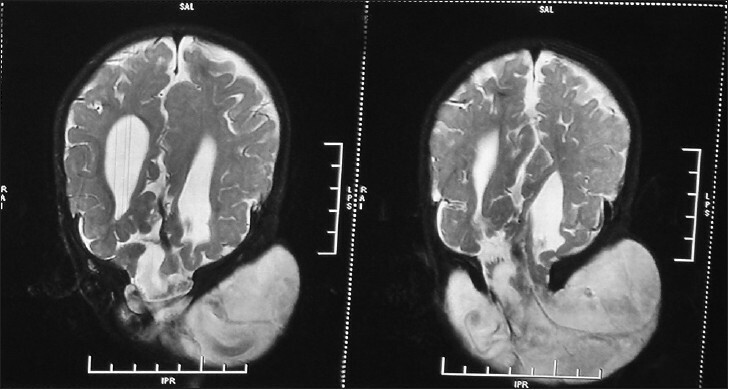 The author presents two cases of torcular encephalocele in infants. Occipital encephalocele occurs between the lambda and foramen magnum, typically in the midline, and is divided into supratorcular and infratorcular types. A 9-month-old infant presented with a large swelling in the occipital region, which was gradually increasing in size since birth and was associated with delayed developmental motor milestones in the form of delayed neck holding and sitting with support. He was the first born child of nonconsanguineous parents, and was delivered at full term. Examination upon admission revealed the size of swelling at approximately 9 × 10 × 10 cm, which became prominent on coughing, and was cystic, fluctuant, and transilluminant in most parts. Pre-operative hematological and biochemistry results were within normal limits. 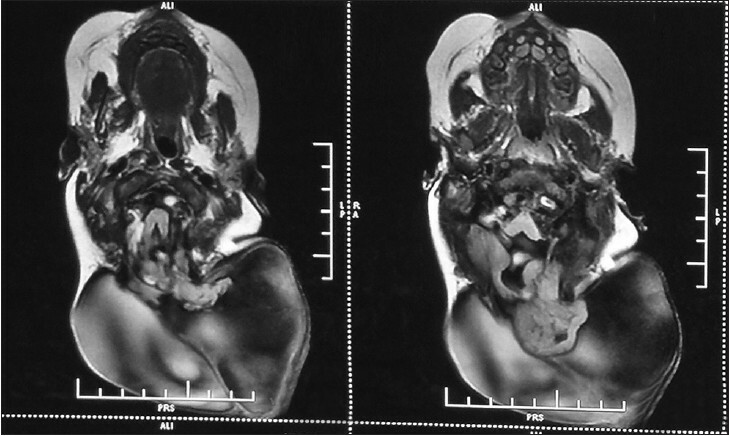 Computed tomography (CT) scan head showed occipital encephalocele with hypoplasia of the corpus callosum and mild ventriculomegaly [Figure 1]. Bone window of CT scan of brain revealed a defect 3 cm in diameter in the occipital bone abutting the foramen magnum. Magnetic resonance image (MRI) brain with MR angiography (MRA) showed herniation of the occipital lobe, cerebellar vermis, and torcular herophili. There was associated agenesis of corpus callosum [Figure 2] and [Figure 3]. Surgical planning was discussed with the parent. The patient was operated upon in the prone position, and care was taken to maintain the fluid and electrolytes balance and normothermia. After transverse scalp incision, the flap was raised with blunt dissection. Bone defect was identified. Herniated meningeal sac was identified and opened. The sac content included gliosed occipital lobe, both occipital horns of ventricles, cerebellar hemisphere, and torcular herophili. The gliosed neural tissue with torcula was not resected but reposited into the cranial cavity along with the torcula and ventricle. Redundant dura was excised and watertight dural closure was done superimposed with the galea. Skin closure was performed in layers. 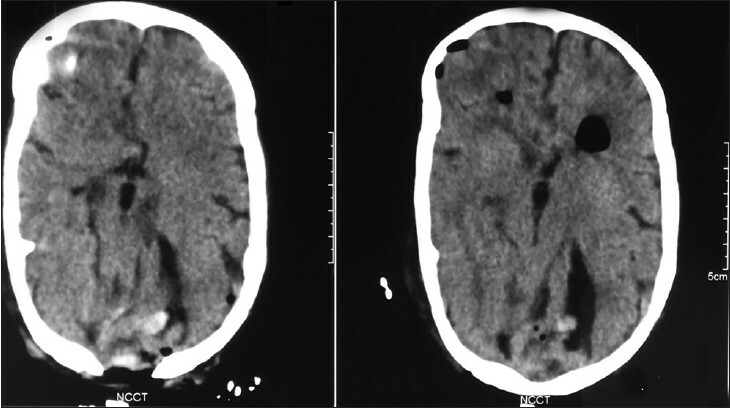 Postoperative CT head revealed no significant increase in hydrocephalus [Figure 4]. He tolerated the surgery well and was discharged on the eighth postoperative day. At the last follow up 3 months following surgery, he was doing well and had improved developmental milestones. A 6-month-old infant was brought with a complaint of discharge of clear fluid following the rupture of occipital encephalocele suggestive of CSF leakage. Size of the encephalocele sac was about 15 × 18 cm, with excoriation of the skin over the encephalocele. MRI brain after birth revealed a giant occipital encephalocele, with the content including occipital lobe and torcula; however, there was no gross ventricular dilatation. The patient was taken up for surgery on an emergent basis, and exploration and repair of the ruptured encephalocele sac was done. A part of the occipital lobe was herniating into the sac; hence, the torcula was carefully reposited into the cranial cavity. Postoperative CT scan showed no increase in ventriculomegaly He tolerated the surgery well and was discharged 14 days following surgery. At the last follow-up at 6 months, he was doing well. Coexistent hydrocephalus may occur due to torsion of the aqueduct of Sylvius or aqueduct stenosis. Hydrocephalus may also occur after excision of the encephalocele due to changes in the CSF dynamics. Management of occipital encephalocele presents a challenge for neurosurgeons, especially if the contents form a significant part of the cerebellum, brainstem, or torcula. In our case, the torcula was herniating along with the cerebellar vermis and dysplastic occipital lobes. Surgery is advocated taking into consideration the cosmesis, risk of rupture, CSF leak and meningitis, content of herniated neural tissue, presence of sinus, associated hydrocephalus, and associated brain and bone anomalies. The patient was positioned prone with care to avoid hypothermia and blood loss; monitoring of electrolytes was of paramount importance. Aspiration of CSF prior to incision may aid the dissection of sac, especially in large or giant encephalocele. Transverse incision is ideal with circular encephalocele having small defect in the occipital bone. However, vertical incision is safer in encephalocele extending above and below the posterior fossa if the sac is separated from the flap.Identification of the content through a detailed study of MRI and MRV may help avoid mishap, as the brainstem and torcula may be present as sac contents rarely. Both the cases presented here had torcula as the sac content, so the aim was to preserve the torcula. Mahapatra et al. advocated preservation of neural element and vascular elements. Walia et al. suggested that although gliosed and ischemic herniated neural tissue can be excised, great caution is required to preserve venous sinuses that may course through it. During surgery, careful dissection and preservation of torcula and venous structures is crucial for optimum outcomes. Dural defect can be repaired by using the pericranium as a graft. Two-layered watertight closure of the dura is better. Since duramater is osteogenic, it helps in significant bone growth, which can eliminate or reduce the size of bone defect; moreover, cranioplasty is rarely required. Accordingly, there is no need to cover the bone defect with a cortical bone in infants and neonates. In the postoperative period, the possibility of aggravation of hydrocephalus should be kept in mind, and if it occurs, it may need shunt surgery. Torcula as one of the contents of the encephalocele is a rare occurrence and is a surgical challenge. However, pre-operative evaluation with MRI/MRV and VER may clearly demonstrate the contents and venous structures and torcula must be identified to ensure careful management during surgery and avoid the damage caused by it, and hence, the associated consequent morbidity and mortality. 1. Mealey J Jr, Dzenitis AJ, Hockey AA. The prognosis ofencephaloceles. J Neurosurg 1970;32:209-18. 2. Bindal AK, Storrs BB, McLone DG. Occipital meningoceles in patients with the Dandy-Walker syndrome. Neurosurgery 1991;28:844-7. 3. Humphreys RP. Encephalocele and dermal sinuses. In: CheekWR, Martin AE, McLone DG, Reigel D, Walker M, editors. Pediatric Neurosurgery: Surgery of the Developing Nervous System. 3 rd ed. Philadelphia: Saunders; 1994. p. 96-103. 4. Lorber J. The prognosis of occipital encephalocele. Dev MedChild Neurol 1967;9(Suppl 13):75-86. 5. Mahapatra AK, Agrawal D. Anterior encephaloceles: Aseries of 103 cases over 32 years. JClinNeurosci 2006;13:536-9. 6. Mahapatra AK. Skull base anatomy, radiology and management. In: Samii M, editor. Skull BaseAnatomy, Radiology and Management. Basel: S Karger; 1994.p. 220-3. 7. Walia B, BhargavaBP, Shandu K. Giant occipital encephalocele. MJAFI 2005;61:293-4.